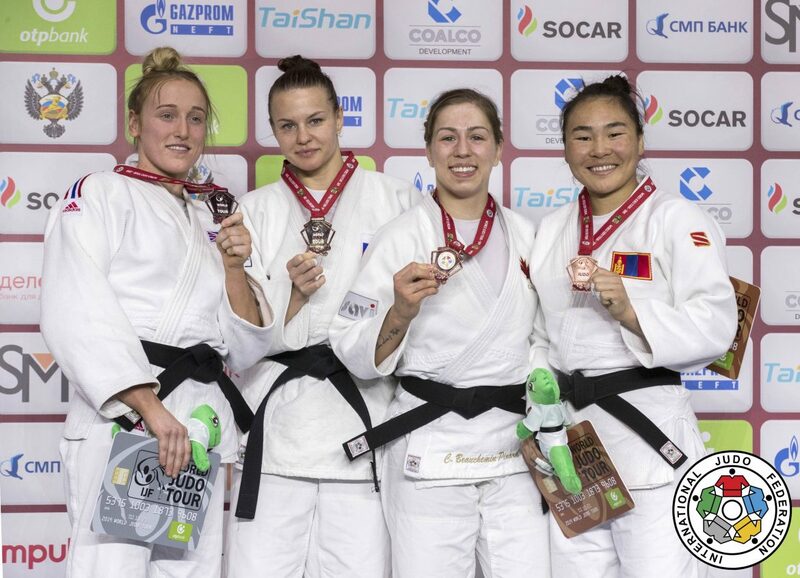 Lucy Renshall narrowly missed on a first career Grand Slam Gold medal as she was defeated in an absorbing -63kg Final at the Ekaterinburg Grand Slam. On the second day of competition in Russia, Renshall showed great determination and a tenacity to dig deep throughout the day as she avenged a number of previous defeats to opponents to further boost her world ranking. It has been a difficult last 12 months for Renshall as she picked up a number of injuries which has halted her progress in the division but she came back with a storm to remind the world of her potential. Following a bye in the opening round, she breezed past Poland’s Karolina Talach in the second round. She worked Talach into the corner of the mat and defended an attempt hip throw from the Polish athlete to work her onto the mat and secure the lockdown. 12th seeded Sanne Vermeer from the Netherlands proved to be a sterner test for the young Brit in Round 3 with a single waza-ari proving to be the difference. Vermeer had got the better of Renshall in their previous meeting earlier this year in the repechage at the Tel Aviv Grand Prix. It was a gruelling Semi Final against Canada’s Catherine Beauchemin-Pinard that lasted over two and a half minutes into Golden Score with neither fighter able to gain the initiative. The difference between the two was finally settled when the Canadian athlete picked up a third shido to send Renshall into her second Grand Slam Final. A pulsating Final against home favourite Daria Davydova kept the crowd on the edge of their seats, and it was a contest that could have gone either way! Both judoka had opportunities to win but it would be the Russian that would take home the Gold as a thunderous display of strength lifted Renshall off of her feet and registered ippon. “This was not her best performance but she is going in the right direction and has a few things to work on”. Earlier in the day, Sally Conway claimed 7th place in the -70kg competition as she was defeated in the Repechage Final by eventual Bronze medallist from Morocco Assmaa Niang. Gemma Howell was eliminated in Round 3 of the same competition as she lost out to eventual Gold medallist, Marie Eve Gahie. Alice Schlesinger crashed out in the same round as she was defeated by Beauchemin-Pinard before eliminated by Renshall.